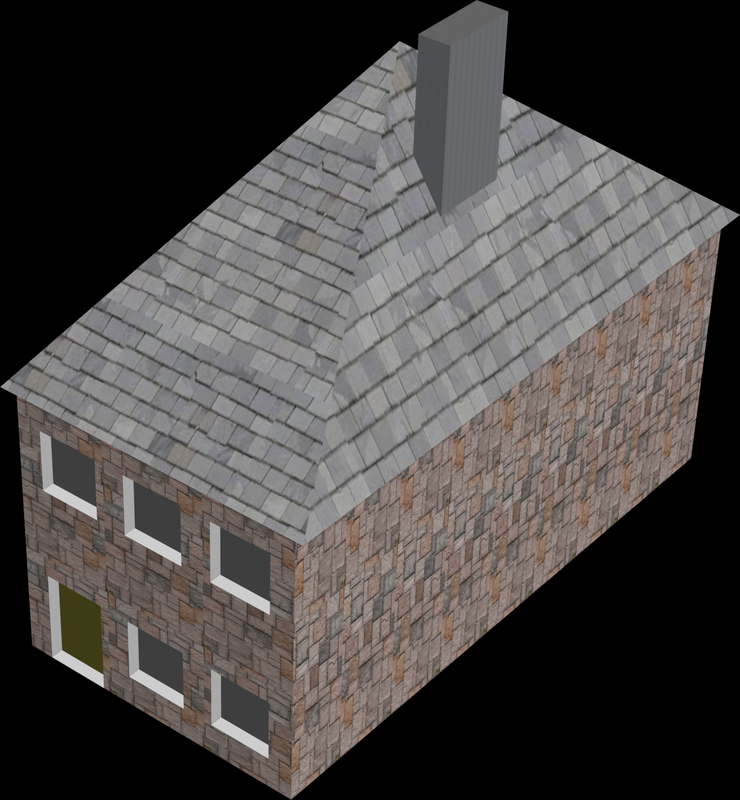 I altered the second tier models to all have the same roof picth and I replaced the double chimney tier 3 models with models with pitched roofs and 1 chimney each. I have finished all the models and collected all the textures needed for the last 2 tiers but I want to use stone roof texture similar to the roofs in the stone houses in default Banished for the first 2 tiers. I also need to alter the textures to make them look older (because nothing looked perfectly new back then). I also don't yet know what to write/code for making mods for Banished. On top of that, I have been really busy with college classes and life. EDIT: @RedKetchup the first tier (what can be placed from the menu) will hold a family of 4, the second tier (first upgrade) will hold a family of 5, the third tier will hold a family of 6, and the 4th tier will hold a family of 8. I still want to go after density so instead of trying to pack more people into one building, I will just pack the same amount of people in smaller buildings. oh ok. so it is always 1 family and it is just the number of children they can have max that change. gotcha. so @AzemOcram : What is happening with it ? did you abanonned ? Sorry for keeping everyone in the dark for so long. I had to put the project on a temporary hold as classes started getting harder (I am taking Organic Chemistry 3 and Microeconomics, while in the early stages of moving from the Greater Seattle Area to Eastern Washington. However, I have gained modeling and texturing (and UV mapping) skills by making a couple of mods for Cities: Skylines. As soon as I have a full day to sit in front of a computer with minimal distractions, I can make all 5 tiers (basic stone abode, nice stone rowhouse with dormers and glass pane windows, 2 story Georgean rowhouse with dormer, 3 story Georgean rowhouse with dormer, and 5 story Italianate rowhouse with basement), with 2 unique models (and their mirror images) for each tier, and 2 texture variations for each model (the 2 rowhouse models with doors on the left will both use the same 2 texture variations (but be mapped differently) and the rowhouses with the doors on the right will use the other 2 texture variations). I am thinking that Sunday will be the best day for me to do the modeling and texturing and for me to make some minor tweaks and coding once CC 1.4 is released. 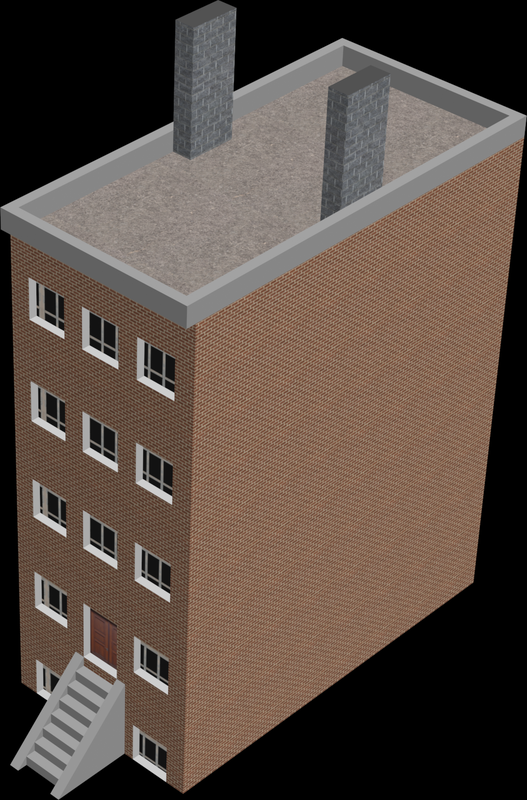 I might also make a brick tenement as an upgrade for the Bunkhouse but that will be for the second released version of my mod and I might eventually create variations of the buildings so that the ground floor would have a shop (but that would require models that overhang their footprints with the housing and shops fitting together perfectly in every combination). However, I should be able to crank out the 40 assets (5 tiers with identical stats, each tier having 2 different models (each model having a mirror image, each model variation having 2 texture variations) by Sunday and share renders of them here and in my thread on Colonial Charter's forum by Monday. If I have time after that, I might make a brick tenement in either Jacobethan or Victorian style (but be simple and look like it would belong in Philadelphia around the time of the revolutionary age). I really like your ideas and the different styles of architecture. Thanks for all your work and I can't wait to see results! I completed all 4 models for the 1st (modest 2 story narrow house) and 5th (5 story brownstones) tiers of my rowhouses. I want to do more research before I make the models for the 2nd, 3rd and 4th tiers and I want to complete all the models before I texture them. I also have some homework I have been procrastinating on. After I finish the remaining 12 models (4 variations for the middle 3 tiers), I will post a picture with the models. Once I texture all the models, I will post a picture with them all textured. After that, I will work on getting them into the game. They will require Colonial Charter to function (because they will rely on glass, bricks, and joists). They will require Colonial Charter to function (because they will rely on glass, bricks, and joists). but if poeple dont have CC, they still can buy glass bricks and joists from merchant boats ? you added those raw material files ? But if people don't have CC, they still can buy glass bricks and joists from merchant boats ? you added those raw material files ? I guess I could make 2 varieties of my mod, one designed for Colonial Charter and one that relies more on stone and less on brick (which would require a change in textures) but requires the town to import the glass and joists at a high price. However, my 2nd release of my rowhouse mod will add a brick tenement upgrade to the bunkhouse (to double its capacity so it will have 10 apartments instead of 5) and have high street shops for placement in the ground floor of special overhanging rowhouses and that later release might not play well with vanilla Banished (without Colonial Charter). I have not written the text files for making my models into a mod yet (so far the only mod I wrote was a climate mod that I used on my own and gave to Kralyerg a couple days ago for adding into CC) so nothing is written in stone. dont do changes. just wanted to know : you added the glass, bricks and joists .fbx and .rsc from CC:EA and put them inside your mod ? I have not attempted to compile my mod yet because I ended up hating my original rowhouses (especially the textures) before I finished them but I have started anew and I like what I made so far but I am not done (I am awaiting the list of sources brockespectre used to research colonial architecture) and I really need to finish some schoolwork and chores. EDIT: Update to prove that I haven't been twiddling my thumbs or lying about my progress. The basic bones of the buildings are very good. What would make it look more 19th century is more decoration, especially around windows, at corners and along the top. Prior to Modernism, people did love their decorative touches.